Mike, Leo, Don and Raph search the streets for Shadow, but can’t find any sign of her. They remember that Shadow liked to play in the box of a local homeless man named Charlie, so they head in that direction. 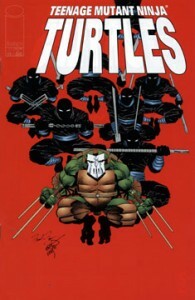 The Turtles discover that Charlie has been murdered by receiving three parallel puncture wounds and they come to the conclusion that he was killed by ninjas. The guys muse over who it could have been, the Dragonlord’s kunoichi? Pimiko? They finally settle on the Foot Clan, and we discover that Raph has actually befriended some of their arch enemies in order to train with them. Raph explains that the other three have outside interests, but he’s a full-time ninja, as are the Foot, so it seemed like a good opportunity for him to have some fun. Leonardo gets angry and calls them hired killers, and Raphael explains that’s what ninjas are (except for the Turtles). Bemused, Raph heads out to question his new-found friends and prove their innocence in Charlie’s slaying. Raph arrives at a warehouse that serves as the Foot’s headquarters and requests an audience with their Clan Council. The other three Turtles arrive at April’s apartment and find Casey Jones destroying Mike’s stuff, screaming in anger over Shadow’s disappearance. Casey sees the TMNT and attacks the nearest ninja, screaming “I’ll kill you, Mike! Kill you!” except he’s grabbed Leonardo by mistake. Casey lets go of Leo and Don tells him to chill – noticing that Jones is extremely drunk. Casey then screams at all of them to get out of his house, and the Turtles begin to leave dejectedly, but April arrives and tells them to stay. Casey begins to cry and states that Shadow is all he has left of Gabrielle. April tries to comfort him and states that they’ll get Shadow back, but Jones gets angry again and stalks off, slamming the door behind him. Back at the Foot HQ, Raphael speaks with the Clan leader, who tells him that the Foot respects the Turtles and would welcome Raphael to join them. Raph asks the leader to tell him that the Foot wasn’t involved in Shadow’s kidnapping so he can inform his brothers and they can search elsewhere, but the Council leader states that the Foot was involved in the crime. When Raph asks why they broke Karai’s treaty between the TMNT and Foot Clan, he is informed that the agents of the Foot didn’t know Shadow was invovled with the Turtles. Raph demands to know where the girl was taken, and he is offered a deal – perform an assassination for the Foot clan, and Shadow’s locale will be revealed. At the apartment, April cries over the situation that Casey and she are in, and wonders how Casey could have changed so much over the years, and she fears that she’s losing him. Mike comforts her by stating that Casey has always loved her and that they’ll find Shadow. Meanwhile, Raph has been lead to a a NYC highrise (where his target resides) by several Foot Soldier observers. Raph repels from the roof down to the floor of the man he’s been sent to kill. Once inside, Raph spots a young woman leaving a bedroom. Raph enters the room and spies his target, a mob boss named Big Tony. The ninja moves in for the kill, but even though he knows that Tony is behind half the crimes committed in a five state area, he can’t bring himself to murder someone in cold blood, and thus he makes for the door. On the way out, he’s spotted by the woman – who is walking with Shadow! The child calls out to her “Unca Raffi” as Big Tony’s companion screams. Lights go on and mobsters bust into the room, firing their weapons. Raph jumps through the window and grabs the rope and begins climbing, but a Foot soldier holding a dagger tells him, “You failed in your task, Turtle! And the Foot doesn’t accept failure!” before cutting the rope, sending Raph into a freefall.